I have a little treat to share today! 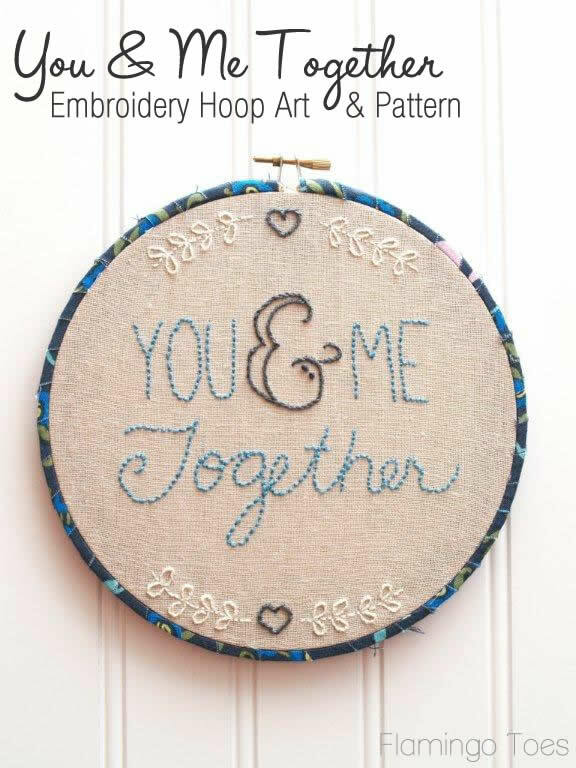 I’ve been working on some Embroidery Hoop Art for my room and I have a sweet little design to share with you today – along with a free pattern! Isn’t it all cute and romantic? I love it! It only uses basic stitches and it goes together pretty quickly. Click Here to open the PDF Pattern for the design. *Please keep in mind that all Flamingo Toes patterns are for personal use only. Do not transfer or sell the pattern, or items made from the pattern. Also, patterns are for Flamingo Toes followers, so please choose to follow along before downloading any pattern. Thanks! You can find instructions for all the embroidery stitches on the How to Do That Embroidery page. Use the back stitch for all the embroidery except for the & symbol. 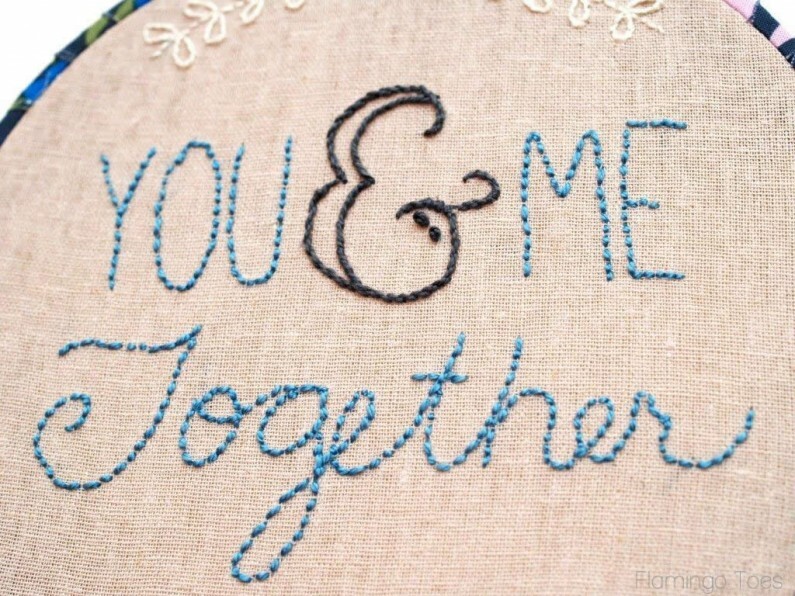 Use a stem stitch for the letter and finish off the little dots with french knots. Once you’ve finished your embroidery, press everything nice and tidy. Wrap the outer ring of the hoop with the fabric strip and glue in place. 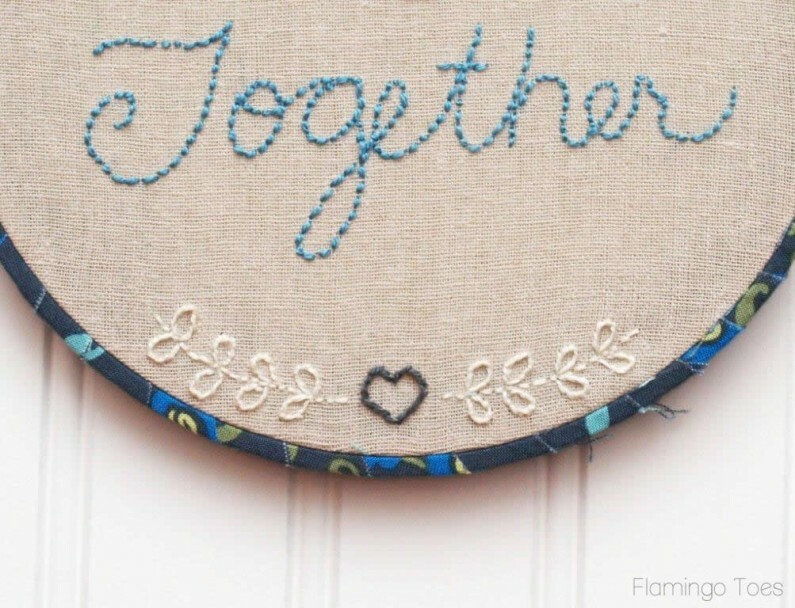 Put the fabric in the hoop and glue a circle of felt on the back of the hoop to finish off everything. It’s super easy to change up to match your room too! Linking up at Sunday Scoop, Today’s Creative Blog, Met Monday, Tutorials & Tips Tuesday, Quilt Story, Shabby Creek Cottage, My Repurposed Life, 504 Main, and the other fabulous parties on the party page – make sure you check them out! This is so sweet!! I’m definitely going to make this for my hubby :) Thank you so much for sharing!! Thank you for this design. My son is getting married in a few weeks, and it is a small backyard wedding that is just the way the bride and groom want. And this will be just a perfect little extra for them!!! I think I will add “May 18, 2013” to it also. Hand embroidery is something I am just starting to get into. 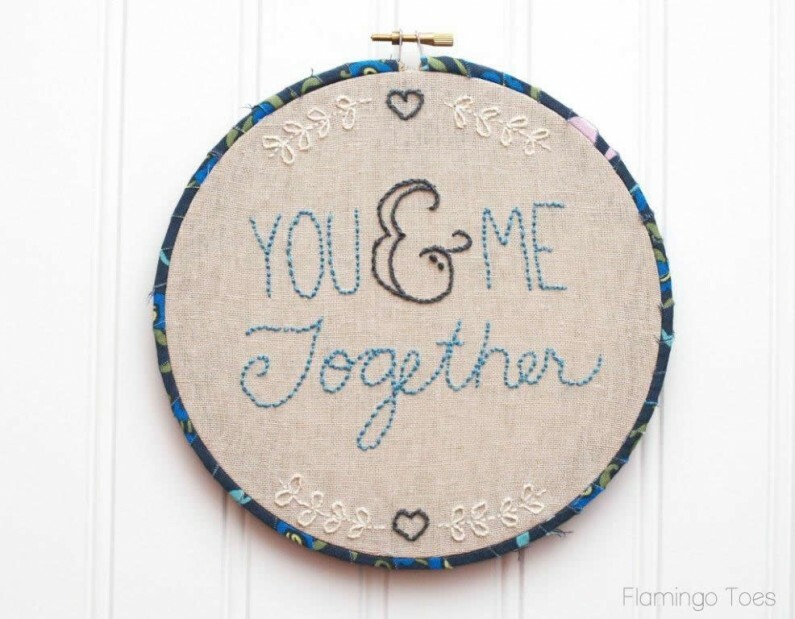 This is super sweet and I’m sure is going to look great in your space! Beautiful stitching. My attempts at embroidery have always resulted in the finished product looking like a web spun by a spider on crack. I especially like the way you have the tutorial on how to form the stitches. I also gave a peep at the recipe binder you did in a past post. That’s a great idea since I’d prefer my recipes in large print instead of the cutesy recipe cards from my 20’s and 30’s. BTW could you do a tutorial or “how to do that” on what camera and conditions you use for your photos. They are so clear and sharp. I look fwd to your posts. Definitely sweet and cute! And I love the way you made the ampersand. I may have to try this!! 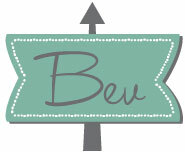 So lovely, Bev! I love both the background color and the embroidery color you chose to compliment the fabric on the frame. So elegant, chic, and artful! When I was a teen and into adulthood, I use to love to embroidery. Got away from that and got into cross stitch, then painting, making necklaces and earrings, then into photography……and I still have everything to get back into all of it! I love embroidery, it gives a elegant old fashion feel. Reminds me of Granny. I love the little details at the top and bottom. Thanks for the patters. I am an embroidery nut!